An interesting — and staggeringly complete — book entitled Il Melodramma Italiano (1861-1900) by Andrea Sessa (ed. Leo S. Olschki, Florence. 2003) lists hundreds of Italian composers working in relative obscurity, in the shadows of the giants,in the second half of the 19th century. Below are a very few (in chronological order of birth) from a long list of lesser known composers whose works appeared at San Carlo in Naples or in secondary theaters in the city in the mid- and late 1800s. I chose them almost at random, perhaps looking for a connection in birth or conservatory study in Naples. It is not easy to determine why they and the others are so little known. A friend suggested to me that "maybe their music was no good." It is true that not all composers are created equal; many of those whose reputations have not held up simply don't bear comparison with the "giants"—Rossini, Bellini, Donizetti, Verdi and a few others. Yet, there have to be other reasons, as well. Commercial success on the part of the opera theaters was driven to a great extent by name composers (see the comments on impresario Domenico Barbaia here and here), which discourages new music. Also, some of these composers apparently got easily discouraged after initial failures (forgetting that Verdi's early work, Nabucco, was greeted by one critic with the comment, "Whoever told this farmer that he could write music?"). Some of them perhaps "dabbled" too much with forms other than opera (see part 7 of this series) in an age and country not amenable to such. And some lacked focus (dell'Orefice, below, ran off to join Garibaldi's campaign against the Papal States in 1867. Writing music was fun, but uniting Italy...!) In general, most of these musicians managed to live from other musical abilities besides composing; they conducted orchestras or directed theater companies, they gave private music lessons or taught at conservatories, and some were concert pianists. Their music was performed rarely even during their lifetimes, and, in a few cases, some of what they composed has never been performed publicly. — Lauro Rossi (1810-1885) was raised in Naples and studied music there. He composed about 30 operas for Naples and elsewhere, including la Casa disabitata for la Scala opera in Milan in 1834. 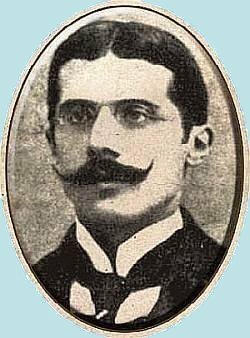 Perhaps he was one of those who got discouraged in the face of competition; he went away to Mexico in the 1840s; he moved to Cuba to be the director of the Havana Theater and eventually back to Italy, where he became director of the Milan conservatory. Rossi was one of the composers who answered Verdi's call to contribute to what was to be a requiem mass for Rossini (but which never materialized, Verdi's portion later turning into his own Requiem for Manzoni). — Giorgio Miceli (1836-1895) studied music at the Naples music conservatory. He was from a "revolutionary" family in that his father actively agitated against the government of the Kingdom of Naples and for the eventual unification of Italy. Miceli had some early success in Naples but the fact that his father had had to flee the kingdom did not help his own attempts to have his music produced at San Carlo. After the fall of the kingdom of Naples (1861), Micelli composed about a dozen operas and some patriotic music, including a hymn to Garibaldi. — Ernesto Viceconte (1836-1877) was from Naples and was a child prodigy, being admitted to the music conservatory at the age of eight. He had an opera performed at San Carlo in 1862, shortly after the unification of Italy. Of his other four or five operas, Selvaggia (1872) is the most noteworthy. He also composed a symphony. His career was cut short at the age of 39. — Riccardo Gandolfi (1839-1920) studied music in Naples but spent much of his professional life in Florence. He was primarily interested in instrumental music and composed at least one symphony. He is best remembered as a music critic and helped found the journal, Rivista musicale italiana. His opera, il Conte di Monreal, opened in Genoa in 1865. — Giuseppe dell’Orefice (1848-1889) is mentioned, above, as the one who went off to fight with Garibaldi soon after leaving the Naples conservatory. He composed instrumental works, two ballets, a few operas and was the conductor of the San Carlo orchestra from 1877-1882. — Niccolò van Westerhout (1857-98) (photo, right) was from Mola di Bari in Puglia, his family having come to Italy from northern Europe in the 1600s. He studied music at the Naples conservatory, eventually teaching there. His opera, Cimbelino (based on Shakespeare's Cymbaline) was produced at San Carlo in 1887, and his Doña Flor was done there in 1896. Of his four complete operas, one, Colomba, was premiered posthumously at San Carlo in 1923, He also composed three symphonies and a violin concerto. He was an accomplished concert pianist. He, too, died young. — Alberto Franchetti (1860-1942) was from Torino. He studied music in Venice, Dresden and Munich. He was a contemporary, obviously, of Mascagni, Leoncavallo, and Cilea, but in spite of his long life never achieved even their "flash-in-the-pan" fame. 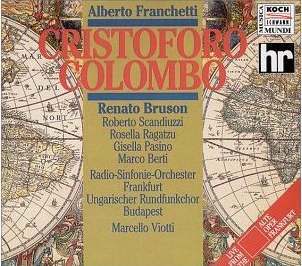 His best remembered work is the opera Cristoforo Colombo, composed for the Columbus quadricentennial exposition in Genova in 1892. (The libretto is by Luigi Illica, famous for his libretti for Puccini's La bohème, Tosca, and Madama Butterfly.) Franchetti composed the work at the behest of Verdi (the obvious first choice! ), who had turned down the offer. Franchetti's opera, Germania (1902) enjoyed some early success. Franchetti was a Jew and his later career was hindered greatly by the unofficial —and then official — anti-Semitism in Fascist Italy of the 1930s. — Giovanni Giannetti (1869-1934) was born in Naples and died in far-off Rio de Janeiro. He was a child prodigy and studied music in Naples and then Vienna. He was only 21 when his opera, Erebo, was performed at San Carlo. He composed a number of lighter operas and some musical comedy, including il Cristo alla festa di Purim (Christ at the Feast of Purim), based on the play by the Neapolitan playwright and poet Libero Bovio. It opened in 1905 in Rio de Janeiro, where Giannetti was the director of the opera house.